A caseworker manufactured evidence against you. 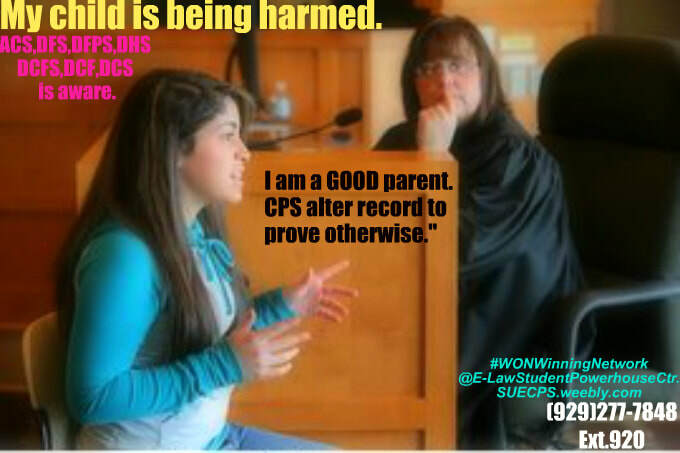 You're awaiting a lawyer to "Care Enough"about your rights, to sue timely by deadline CPS. $5,000.000 (Five Million) WON against a state agency for allowing a teenager (boy age 17)who was sexually abused/fondle while living under state supervision, when removed from a New Jersey home." NOT ALL SUITS are public. >Child raped under state supervision while caseworker lies to the family court. >Child being overly medicated with dangerous psycho-tropic drugs. > Child starved/not fed/foster care abuse. >.Child sexually molested under state supervision. >Child force to lie on a loving parent,grandparent. >Child lost in the same system that swore to protect while out of their home. >Wrongful Death while child was residing under state supervision of Maine DHHS Pennsylvania CYS,DHS, Delaware DFS,NJ,NY,UTAH,IOWA,TEXAS,nationwide. Be sure to however fill out e-help form CLICK HERE or on OUR POPULAR 1-of-a-kind facebook." -Unspecified $$$Damages has been won for a teen-child in NY with her father while dad sued astutely (without a lawyer pro-se) 2 ACS employees,child protection services in NEW YORK CITY and won." Caseworker informed a loving concerned-GRANDMOTHER do not call the DCPP,DYFS,DCF hotline anymore. As a result of such, a child, little boy who should have been spared pain/staid injuries was seriously injured.Suit WON against such agency employees. Parent wins the right as her daughter's to their $50MILLION damages CIVIL RIGHT LAWSUIT, against multi-liable agency workers, who allowed child to severely suffer, in which a judge has went on the record and called,"INHUMANE tragedy"and the worse case he has ever sen his entire time on the bench...(I think that says it all,everyone.) 1-929-277-7848. Lying under oath/ PERJURY TO A MATERIAL FACT.